Cascades 2 is a property providing self catering in Green Point for up to 2 guests visiting the Atlantic Seaboard region. 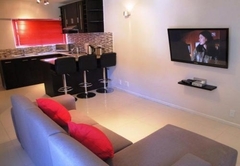 Cascades 2 is a self catering studio apartment located in the popular area of Green Point. The apartment can be found in a secure apartment block within easy reach of restaurants, cafes, the golf course, Green Point Stadium and shops. From here you are roughly 30kms from the airport and are close to major transport routes, making travel to must see attractions easy. Cascades 2 studio apartment is open plan and has a combined living and sleeping area. The unit sleeps two guests in a king size bed with luxury linens. The bed can be separated into two single beds if preferred. 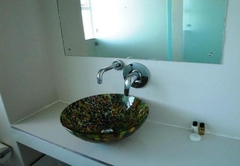 There is an en-suite bathroom with a shower and towels are provided. The living area has a corner couch and a TV with a DVD player. From here you can walk out onto a balcony where you can unwind and relax after a busy day. There is a fan and a heater for your comfort. The kitchen is modern and well equipped with an oven, hob, fridge, microwave, kettle, toaster, crockery, cutlery and cookware. 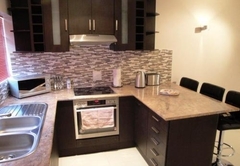 The apartment has a concierge with 24 hour security and there is secure parking for your vehicle. 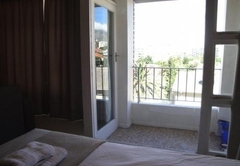 Renovated Studio self-catering apartment in Green Point on the slopes of Signal Hill. Within easy walking distance to the V&A Waterfront and surrounded by shops, bistro's, top restaurants and night life. Response timeCascades 2 typically responds to requests in 5-10 minutes.